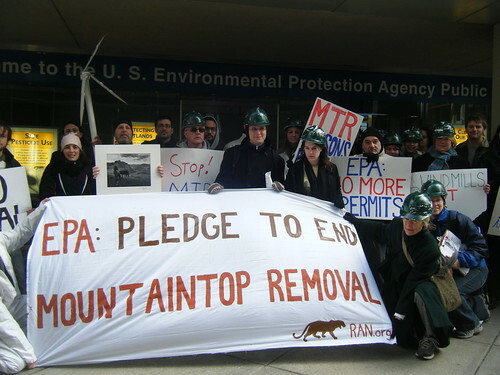 This morning activists in Philadelphia descended upon their Regional EPA branch to put an end to Mountaintop Removal mining (MTR). Decisions made here in Philly have devastating consequences for Appalachian communities and our country as a whole. Activists prepared to enter the building and risk arrest by sitting-in until they were granted a meeting with officials inside, and after a successful engagement and demands met, the rally of 40 people exited. In recent months, the EPA has wavered in their position on mountaintop removal coal mining (MTR); in particular with the recent approval of the high profile Hobet 45 Mine permit. Philadelphia’s EPA has oversight of MTR permits for Virginia and West Virginia, which includes the Hobet 45 Mine. Philadelphia’s Region 3 EPA is considering 16 upcoming MTR permits and is responsible for the enforcement of the Clean Water Protection Act at existing MTR sites, which makes it a critical agent in ending the mining practice. This has become a national issue. Appalachians can’t wait any longer, and Philadelphia activists met this urgency with action. 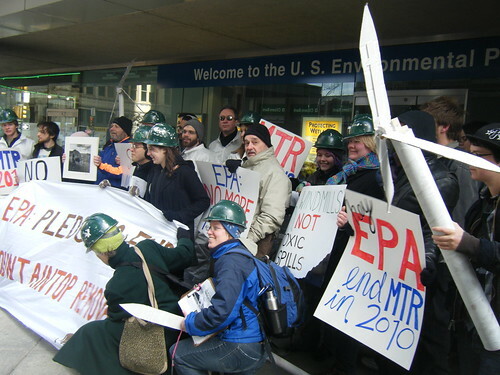 Meanwhile, there is a simultaneous rally at EPA’s region 4 in Atlanta GA, also responsible for MTR permitting. Every day, across Appalachia, the coal industry literally blows the tops off of historic mountains, impoverishing communities, poisoning drinking water, clear-cutting entire forests, wiping out the natural habitats of countless animals, and sacrificing the heritage and the health of families across the region. The EPA estimates that more than a million acres of American mountains across Appalachia have already been lost to MTR, and yet they allow it to continue. We woke up at 3:30am, but few of us had slept the night before. You’d think we’d be groggy, but the adrenaline and excitement propelled us into action. By 5:30am two trucks holding steel barrels reading “good jobs, healthy communities: we deserve a clean energy future” and “prosperity without poison” pulled into the rendezvous point. My heart was pounding as I pulled a van full of concerned citizens and young activists to meet them, two more cars trailing me. A half hour later we all jumped out at the entrance to Dominion’s new $1.8 Billion coal-fired power plant in Wise County VA. Within seconds we had a blockade. 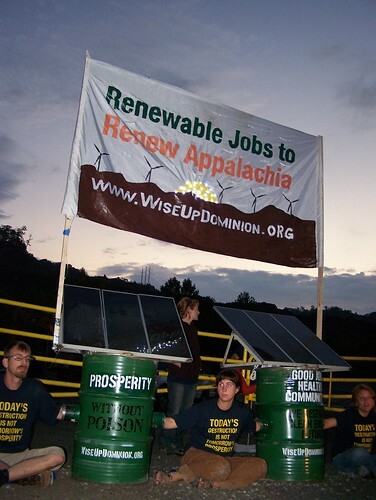 Nine people were connected to concrete-filled barrels, two of which donned six large solar panels illuminating the sun in the background of a large banner reading “Renewable Jobs to Renew Appalachia.” Two more chained themselves to gates, keeping them closed. Our solar lit banner stretched out above the rosy smiles of visionaries young and old. It was a true privilege to work with such skilled organizers and help coordinate one of the most fluid, tight, and positive Nonviolent Direct Actions I’ve ever been a part of. I’m not from Appalachia. I’m here because I’ve been deeply inspired by coal-field residents who have spent their lives standing up for clean air and water, good green jobs and a better future for their families. And it’s made them subject to intense harassment and intimidation. Wise County citizens have been fighting this Dominion plant for over two years; they’ve spoken out at every public hearing, filed ever paper and lawsuit possible, and gotten 45,000 people to sign a “mile long” petition to the governor. And now many took the next step and invited friends from around the region and country to join them in solidarity for the first ever protest at this plant. Nonviolent Direct Action is about risking one’s own personal safety for the greater good. It is an act of courage that can come with some severe consequences. That people travel from all around to support this local struggle is emblematic of the world we are fighting for – one in which we look out for one another and support each other, even when that comes at personal cost. 11 of the activists today were arrested and are currently navigating their way through the labyrinth that is the U.S. legal system. We have a vigil setting up for them as I type this. Alongside those (mostly young people) who chose to put their bodies on the line, came a contingent of cheering protesters of all ages, including a nun, ex coal miner, veteran, schoolteachers, and students. The positive energy was infectious: there was a sense of agency and empowerment shared among all of us, even as we choreographed an elaborate and potentially dangerous dance between police and Dominion employees. The action was courteous, respectful, and residents who were new to this type of action kept remarking about how it was a “class act.” The words “classy,” “beautiful,” “reasonable,” and “respectful” were constantly heard both from Wise County residents, passers-by in cars and trucks, and even the police. It’s no surprise people were ready to take such a step – and to take it so seriously. Wise County has already had 25% of its historic mountain ranges destroyed forever to mountaintop removal mining. We’re not just talking about saving the environment here, we’re talking about cultural survival for one of the poorest regions of the country. Click below for more story, pictures, & media links.